In 4-quart saucepan, heat olive oil, onion and garlic over medium heat 5 to 10 minutes, stirring frequently, until onion is soft and translucent. Reduce heat to low. Add tomatoes; heat 30 minutes, stirring occasionally. Remove from heat; add remaining soup ingredients. In blender, place soup mixture. Cover; puree until smooth. Spread butter on 1 side of each bread slice. 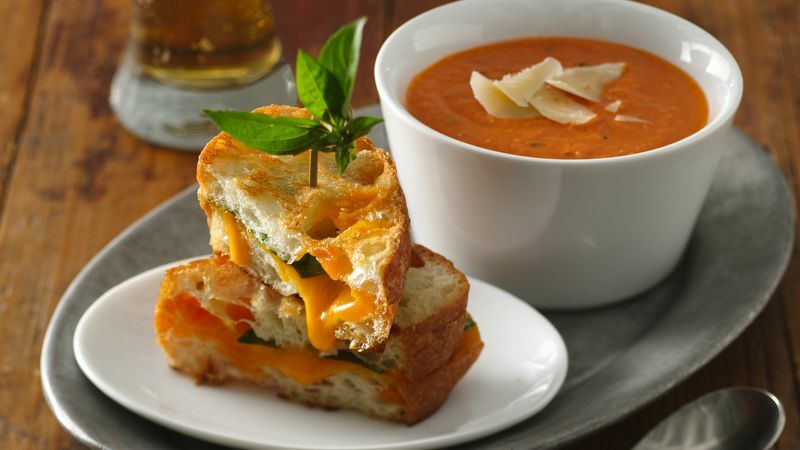 Arrange 6 slices bread, buttered side down, on work surface, and place 2 slices cheese and 2 basil leaves on each bread slice. Top with remaining 6 bread slices, buttered sides up. In 10-inch nonstick skillet, cook 2 sandwiches at a time over medium heat until golden brown and cheese just melts; repeat for remaining sandwiches. Serve with soup.